Russian Circles to annexe Baltic Triangle, as Getintothis’ David Hall reports on this geo-political turmoil – the geo being geometry, of course. Chicago post-metal heroes Russian Circles will take to the road in the spring, and visit Liverpool as one of just three UK dates on their European tour. In support of a much anticipated vinyl reissue of their sophomore album, 2008’s Station – through Sargent House, the good folks who brought us the likes of And So I Watch You From Afar and Deafheaven – the post-rock heavyweights have just announced a brand new tour. Constellations is set to be rocking on April 29, when Russian Circles, when the instrumental metal merchants hit the Baltic hard with their thunderous blastbeats and apocalyptic riffing, blended with the distinct drama of post-rock at its most dynamic. Fans of Pelican and This Will Destroy You will find plenty to enjoy in Russian Circles’ frequently bloody-minded mentality, their music full of heaviness, devastating breakdowns and blinding, propulsive technicality. Theirs is a subtle and dynamic blend of post-metal however, sludgy, dark and heavy in places, but also incorporating eminently danceable passages, sitting comfortably alongside their moshpit-rousing, full-pelt roar. 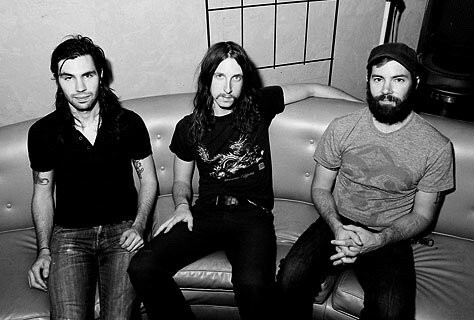 Russian Circles play Constellations on Friday, April 29 with support TBC.